A floating solar farm has been installed in Lismore, northern New South Wales – it’s Australia’s first foray into floating solar and the Lismore City Council are hoping to have construction completed today. It should be fully functional by mid-December. 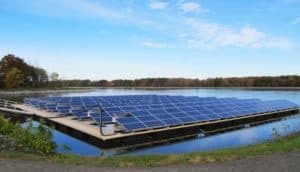 The 100kw floating solar farm, located at the Lismore City Council sewage plant, will be constructed by Suntrix and will be capable of generating around 12% of the power required by the sewage plant. “This particular pontoon will be floating by tomorrow, which is really exciting but the aim is to have it all connected and up and running by mid-December,” Lismore City Council’s Environmental Strategies Officer Sharyn Hunnisett said. Ms. Hunnisett also noted that this is merely the first step in Lismore City Council’s plan to power their sewage plant via renewable energy – telling the Northern Star that they are hoping to upgrade and expand the plant over the next six months. “We will have to do our calculations but we are hoping a minimum of 400kw in the future,” Ms. Hunnisett said. The Lismore floating solar farm is one of many measures the Lismore City Council has put in place as per its Renewable Energy Master Plan. They have set themselves the ambitious and admirable target of generating all required electricity via renewable sources by 2023. This makes them the first regional council in Australia to commit to making its electricity supply 100% renewable. Solar power in Lismore is gaining a lot of traction recently, with Farming the Sun and Lismore City Council working in tandem on the floating solar farm, and also the construction of a 99kW rooftop PV solar system on top of the Goonellabah Sports & Aquatic Centre. The Rainbow Power Company, based in Nimbin, was responsible for the build at the Aquatic Centre.